In this work we propose an innovative approach to particle tracking based on CMOS Active Pixel Sensors layers, monolithically integrated in an all-in-one chip featuring multiple, stacked, fully functional detector layers capable to provide momentum measurement (particle impact point and direction) within a single detector. This will results in a very low material detector, thus dramatically reducing multiple scattering issues. To this purpose, we rely on the capabilities of the CMOS vertical scale integration (3D IC) technology. A first chip prototype has been fabricated within a multi-project run using a 130 nm CMOS Chartered/Tezzaron technology, featuring two layers bonded face-to-face. Tests have been carried out on full 3D structures, providing the functionalities of both tiers. To this purpose, laser scans have been carried out using highly focused spot size obtaining coincidence responses of the two layers. Tests have been made as well with X-ray sources in order to calibrate the response of the sensor. 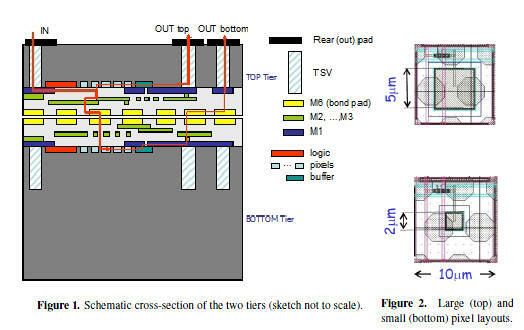 Encouraging results have been found, fostering the suitability of both the adopted 3D-IC vertical scale fabrication technology and the proposed approach for particle tracking applications.